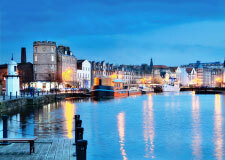 Great quality Edinburgh restaurants can be found around every corner of this international city. Whether you're looking to sample fresh local seafood, Highland game or something a little more exotic, you can find and book Edinburgh restaurant offers and deals to suit all palettes and budgets with 5pm. La Casa Edinburgh’s Dalry serves an intriguing mix of Spanish and Greek tapas dishes. It is run by a young family who source ingredients from only top suppliers to ensure authenticity. Regular performances from a Spanish band and flamenco dancer result in a lively festive atmosphere reminiscent of flamenco bars of Andalucia. Upstairs on the fourth floor of Harvey Nichols department store is a hidden Edinburgh treasure — a smart, contemporary restaurant offering spectacular views of both the city and the Firth of Forth. Here, the kitchen brigade showcase the finest Scottish produce through inventive combinations, modern flavours and traditional techniques. Pristine white tablecloths and touches of designer flair create a stylish setting to enjoy it all in. Located upstairs in the Harvey Nichols department store, Forth Floor Brasserie specialises in serving up modern Scottish and European cuisine, alongside breakfast, brunch and afternoon tea. All dishes are beautifully presented, meaning that both the view and your plate will be competing for your admiration. Badger & Co is on Castle Street in the former home of Kenneth Grahame, the author of Wind in the Willows. This history plays a prominent part in the decor. Think Toad Hall's padded leather seats, chandeliers and wood panelled walls. There are deer heads wearing wigs and a picture of a well dressed badger riding a penny farthing. It’s how a 21st century hipster might imagine an Edwardian gentleman’s club. As well as a private dining room, there are several intriguing nooks and crannies and a courtyard for al fresco drinks and dining. Based on Buckstone Terrace in Edinburgh's Fairmilehead, Charwood is a restaurant, char grill and lounge bar which acts as a community hub and events space for the local area. The interior is spacious, bright and colourful. An award-winning, family-friendly venue, it has a weekly pub quiz, kids' club and also shows sports in the lounge bar. 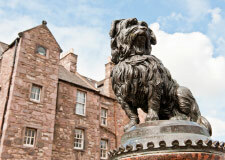 Elliot's Bar & Restaurant is part of Apex Waterloo Place Hotel in Edinburgh city centre. Its bright, modern design blends seamlessly with period features such as the corniced ceilings and Georgian windows and fireplace. Extremely well located on Waterloo Place, Elliot's Bar and Restaurant lends itself to business lunches, pre-theatre dinners; a mid-afternoon shopping stop, after work drinks or a romantic dinner. Whether you're dining with friends, colleagues or enjoying a romantic evening out, you can find a plethora of offers, deals and customer reviews for restaurants throughout Edinburgh. Take in Edinburgh's historic charm in the heart of the city's ancient commercial district with restaurants in the Old Town. Enjoy the prestige of Edinburgh's Georgian architecture with our New Town restaurants and dining experiences commanding spectacular views of Edinburgh Castle. Head to Leith's restaurants for the best seafood caught fresh from Scotland's coast, easily reached just north of Edinburgh's city centre. 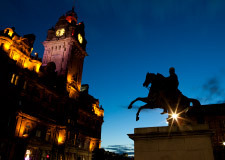 Enjoy a pre-theatre dinner or eat out after theatre events or visiting Edinburgh's Filmhouse at restaurants in Edinburgh's bustling West End. The quality of service was extremely poor, the waitress did not know about our offer, was not aware of how to serve us. The 3 gin drinks came almost at the same time and were not explained properly or served with enough time to drink and enjoy them. The scones were rock hard, not enjoyable at all for an afternoon tea at that price. Not value for money at all, very disappointing. Very enjoyable and delicious meal. Portions in sides are generous. We had one of the booths which was great for easy conversation. Tower Restaurant on top of Edinburgh's National Museum of Scotland is a stunning location for a meal. Its head chef Jose Dalto showed us how he makes one of their most popular dishes: hand-dived scallops with skordalia potato, crispy ham and bouillabaisse sauce. Head Chef David Scott from Blackwood's Bar & Grill at the Nira Caledonia in Edinburgh’s New Town shows us the restaurant’s Josper Grill and cooks us a juicy steak in it using his own seasoning mix of 7 spices and salts.